Want a dark & dismal future? Then follow the Germans. All lies and promises – the wind industry has finally been rumbled in Germany and is about to be shown the door in Australia. The wind industry and its parasites have been guilty of more than just a little hubris. Claiming to be able to deliver cheap, reliable sparks was always going to be their undoing. Gradually, Europeans are waking up to the unassailable fact that wind power is based on a technology that was redundant before it began. No modern economy can run with electricity delivered at crazy, random intervals. To compensate for that meteorological fact, Germany is flat out building more coal fired power stations – not less. Around the globe the wind industry promises to displace “dirty” coal fired power and Germany is no exception. But the reality is very different: the facts have finally caught up with them – wind power will never replace fossil fuel generators and the cost of having capacity to back up wind power is astronomical. German industry is bailing out and heading to the US – where power is a third of the cost that it is in Germany – and some 800,000 German homes have been disconnected from the grid – victims of what is euphemistically called “fuel poverty”. For Germans the attraction to wind power is fading fast – funny about that. A group of Swiss energy market economists have launched a scathing attack on Germany’s wind and solar policies: “Development And Integration Of Renewable Energy: Lessons Learned From Germany” – Hans Poser; Jeffrey Altman; Felix ab Egg; Andreas Granata; and Ross Board – July 2014 (pdf available here). We’ve extracted some of the key findings and conclusions below. Over the last decade, well-intentioned policymakers in Germany and other European countries created renewable energy policies with generous subsidies that have slowly revealed themselves to be unsustainable, resulting in profound, unintended consequences for all industry stakeholders. While these policies have created an impressive roll-out of renewable energy resources, they have also clearly generated disequilibrium in the power markets, resulting in significant increases in energy prices to most users, as well as value destruction for all stakeholders: consumers, renewable companies, electric utilities, financial institutions, and investors. The rapid growth of renewable energy in Germany and other European countries during the 2000’s was due to proactive European and national policies aimed at directly increasing the share of renewable production in their energy mixes through a variety of generous subsidy programs. Two main types of subsidy programs for renewable power developed in Europe include feed-in tariffs (FITs), which very quickly became the policy of choice for Germany and many other European countries, and quota obligation systems. FITs are incentives to increase production of renewable energy. This type of subsidy guarantees long-term (usually for 20 years) fixed tariffs per unit of renewable power produced. These fixed tariffs normally are independent of market prices and are usually set by the government, but can be structured to be reduced periodically to account for technology cost decreases. The level of the tariffs normally depends on the technology used and the size of the production facility. Because of their generosity, FITs proved capable of quickly increasing the share of renewable power, but since the FITs are set administratively, it is difficult to meet renewable energy goals in the most cost-effective way possible. Policymakers underestimated the cost of renewable subsidies and the strain they would have on national economies. As an example, Germany’s FIT program has cost more than $412 billion to date (including granted and guaranteed, but not yet paid FIT). Former German Minister of the Environment Peter Altmaier recently estimated that the program costs would reach $884 billion (€680 billion) by 2022. He added that this figure could increase further if the market price of electricity fell, or if the rules and subsidy levels were not changed. Moreover, it is estimated that Germany will pay $31.1 billion in subsidies for 2014 alone. A recent analysis found that from 2008 to 2013, Germany incurred $67.6 billion (€52 billion) in net export losses because of its high energy costs, compared to its five leading trade partners. Losses in energy intensive industries accounted for 60 percent of the total losses. This was further highlighted by a recent International Energy Agency report, which stated that the European Union (EU) is expected to lose one-third of its global market share of energy intensive exports over the next two decades due to high energy prices, expensive energy imports of gas and oil, as well as costly domestic subsidies for renewable energy. Retail prices to many electricity consumers have increased significantly, as subsidies in Germany and the rest of Europe are generally paid by the end users through a costsharing procedure. Household electricity prices in Germany have more than doubled, increasing from €0.14/kilowatt hour (kWh) ($0.18) in 2000 to more than €0.29/kWh ($0.38) in 2013. In Spain, prices also doubled from €0.09/kWh in 2004 to €0.18/kWh in 2013 ($0.12 to $0.23) while Greece’s prices climbed from €0.06/kWh in 2004 to €0.12/kWh in 2013 ($0.08 to $0.16). Comparatively, household electricity prices in the United States average $0.13/kWh, and have remained relatively stable over the last decade. Fossil and nuclear plants are now facing stresses to their operational systems as these plants are now operating under less stable conditions and are required to cycle more often to help balance renewables’ variability. Investments in retrofits will be required for these plants in order to allow them to run to these new operational requirements. Moreover, renewable resources are dramatically changing thermal plants’ resource planning and margins. As a result, many of these plants are now being retired or are required to receive capacity payments in order to economically be kept online. Large scale deployment of renewable capacity does not translate into a substantial displacement of thermal capacity. Because of the variability of wind and solar, there are many hours in the year during which most generation comes from thermal power plants, which are required to provide almost complete redundant capacity to ensure the reliability of the system. 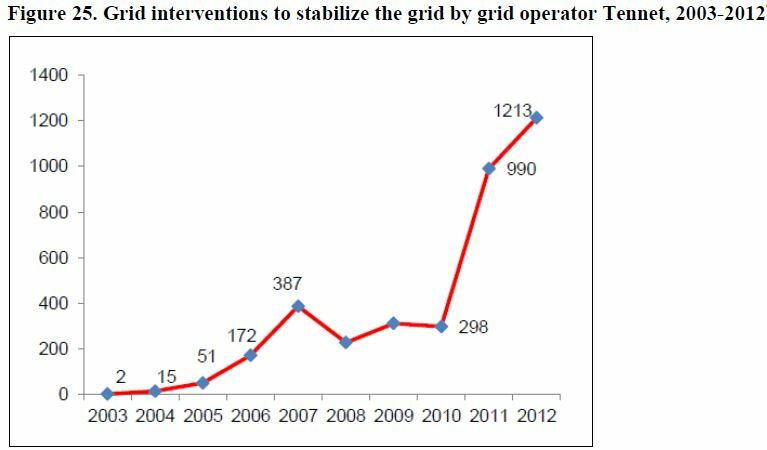 In turn, grid interventions have increased significantly as operators have to intervene and switch off or start plants that are not programmed to run following marketbased dispatching. For instance, one German transmission operator saw interventions grow from two in 2002 to 1,213 in 2013. It is higher amounts of renewables with low full load hours relative to the total portfolio of power production that creates greater variability and strains on the grid. In the case of Germany, it is the large-scale deployment of both wind and solar that has impacted the entire system. Large-scale investments in the grid are being required to expand transmission grids so they can connect offshore and onshore wind projects in the north of Germany to consumers in the south of the country. The total investment cost for the build-out of German onshore and offshore transmission systems is estimated to be around $52 billion (€40 billion) over the next 10 years. Moreover, the grids are now being challenged to meet the dynamic flows of variable renewables and require significant additional investment to accommodate increased penetration of renewables. All of these costs will ultimately be passed on to electricity consumers. This has not gone unnoticed in Germany or in the EU. A report was released in late February 2014 by an independent expert commission mandated by the German government, which concluded that Germany’s current program of incenting renewables is an uneconomic and inefficient means to reduce emissions and therefore should be stopped. Moreover, the European Commission released new guidelines on April 9, 2014, with effect starting in 2017 that will correct market distortions. It will essentially ban all FIT subsidies and introduce technology agnostic auctions as the only incentives for renewables. The more variable renewables there are, the more the thermal power plants will serve as back-up and balancing for renewables. Figure 24 shows the daily production of solar, wind, and conventional generation in Germany. The maximum daily solar and wind-combined production in 2012 was 530 GWh on January 5, 2012, while the minimum was only 30 GWh on December 19, 2012. Given the average daily power consumption of around 1,643 GWh in Germany, this means that in spite of the 13.2 percent share of wind and solar power in total power generation, there must be almost complete redundant capacity of thermal plants or storage. Wind and solar energy, by their very nature, are highly variable, with fluctuations in weather conditions causing significant variance over multiple timescales: seconds (gusts of wind and passing cloud cover), minutes (wind speed variations, briefly overcast skies), days (diurnal cycles, creating peaks of solar condition), months/quarters (seasonal cycles), and years (annual variation in environmental conditions). 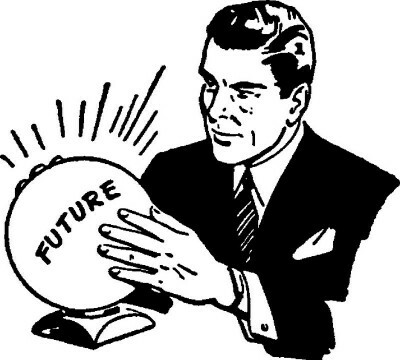 At yearly and seasonal levels, both wind and solar generation can be forecasted with relative certainty. It is when considering diurnal (daily) generation profiles that variability occurs and requires system operators to intervene and make sure that supply and demand of electricity are equal at all times. In Germany, as the percentage of renewable power increased, so did the number of times that grid operators had to intervene to rebalance the market. In 2012, there were 1,213 such interventions. For new thermal power plants to replace the currently uneconomical power plants once they reach their technical lifetime, current prices will have to rise. The effect of fewer operational hours needs to be compensated by higher prices in these hours. As a consequence, it is likely that markets will experience lower prices in times when there is sufficient renewable power and much higher prices at other times. Renewables generate higher direct costs than traditional power production. Traditional base load wholesale power can be generated in Germany at around €65/MWh, but wind power and solar PV in Germany receive a FIT of around €90 /MWh. Because renewables, like wind and solar, do not produce at certain times, available back-up power to the system is required. The back-up capacity must be financed even if it is used only occasionally as back-up. Therefore the little power that is produced in the back-up plants will become expensive. Data drawn from business models of Finadvice show that a CCGT can produce 3000 GWh per year at fixed costs of €11/MWh, in a power system without renewables. If renewables reduce the production of the CCGT to for example 1500 GWh, the price needed to recover fixed costs will double to €22/MWh. In a nutshell, this could mean that the cost of power in the hours with renewable power is the subsidized €90/MWh instead of conventional €65 MWh, and when there is no renewable power, the (back-up) power price will be €76/MWh (65 + 11). The United States and other countries have a unique opportunity to assess the lessons learned in Germany and other European-member states and achieve positive results at lower cost and risk for all stakeholders. While in the past, German wholesale prices followed the demand curve, they now react to the weather, going down when the sun shines and the wind blows, and up, during times of high demand, when the sun does not shine and the wind does not blow. Accordingly, price forecasts and power trading now require new modeling and different inputs, including a much greater focus on weather forecasting. Power trading has become more short-term (intra-day, quarter hour, regulation, capacity) than in a conventional generation environment. Regulatory policies were not designed to incentivize flexible renewable power to be available where and when needed. Therefore, further regulatory interventions will be required to create a balanced system that will ultimately impact investments for both renewable companies and utilities over time as various energy markets transition to an increased portfolio of renewables. The power grid has to be upgraded to accept dynamic power input from many decentralized and distant variable sources. In the absence of energy storage, current electric systems cannot easily cope with the surplus of renewable energy, and curtailment will be required at times in order to maintain reliability. Intermittent renewables, like solar and wind, tend to cannibalize their own market by reducing prices when they are available. With current cost structures, if wind and solar are to produce a significant share of the power generation, they will likely require support through energy storage or additional subsidies to be profitable. In conclusion, the lessons learned in Europe prove that the large-scale integration of renewable power does not provide net savings to consumers, but rather a net increase in costs to consumers and other stakeholders. Moreover, when not properly assessed in advance, large-scale integration of renewables into the power system ultimately leads to disequilibrium in the power markets, as well as value destruction to both renewable companies and utilities, and their respective investors. The takeaway from all that is that if Australia wants energy market chaos; energy poverty; and to kill what’s left of its manufacturing sector it need only keep following Germany’s lead. The mandatory RET must go now. No time like the present to avoid an energy market disaster. 1/ solar based renewables are no threat to their business. 2/ Nuclear could put them out of business. It is therefore to be presumed that they have an interest in fostering the craze for wind and solar and biofuels, and also the fear of nuclear. “The market can stay irrational for longer than you and I can remain solvent”. Lessons learned! That is the problem. The politicians take years to grasp a simple lesson. A must read on the devastating and catastrophic failure of Germany’s ‘energiewende’. Much praise to the Abbott administration. The UN/EU law makers on renewable energy have made very expensive and grave mis-calculations. How could this be? A wonderful analysis and determination of where we are at and what needs to be done. Thank you to the seekers of truth and damnation to the rent seekers, charlatans and deceivers. To all of you, judgement day awaits. What part of “It doesn’t work ” that our politicians don’t understand ?